A visit to a Wyoming distillery is like a visit to Wyoming: it should be sipped slowly and savored. 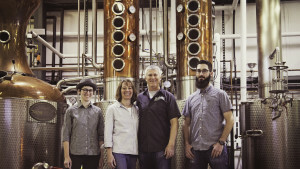 With distilleries in six destinations throughout Wyoming—including Kirby, Laramie, Jackson, Mills/Casper, Pine Bluffs and Sheridan—it's safe to say that locals and visitors alike are slowing down and exploring the local distillery scene by sampling cocktails in distillery tasting rooms, ordering local spirits at various watering holes and even taking behind-the-scenes tours to learn more about the art of making spirits at high elevations. Many Wyoming distilleries use locally sourced products—like corn, sugar beats and honey—to make their distinct drinks. Interested in visiting Wyoming distilleries? Plan a distillery road trip or browse the listings below.